I parked on the outskirts of the town, and took the new NET tram to the city centre. The new square was supposed to be opened for the Xmas market (see earlier entry in this blog), but of course, whoever believes a builders promise? Here it is, still 'almost finished'. To be honest, I preferred the old square, and think that the millions they have spent on 'improving' it were wasted. However, I suppose you have to make the best of what you've got, and residents will eventually get used to it. This is the view at the moment, with my back to the council house (that's the next target to spend more of the taxpayers money - a re-vamp of the building). Boring and flat, isn't it? This isn the view towards the council house. Some things are sacrosanct though, they wouldn't DARE take the lions away. Many a tryst has started with the words; "I'll meet you at the lions". Now these I DO agree with! Sleek, comfortable, and affordable. The new trams are worth every penny, and the long inconvenience to traffic they caused during construction and track laying. I think they SO fit in with the city, and I use them whenever I go. Looking down exchange walk, with the flower seller. This is inside a shop. I was amazed at the great prices for really nice stuff. It's called 'stone the crows', and is on Hounds Gate. No trip to Nottingham would be complete without a visit to the castle. I was really disappointed to find they are now charging £3:50 for a 'combined ticket' for the castle and the museum. As I lived in Nottinghamshire for twenty years, I have seen the museum and castle dozens of times. All I wanted to do was walk the grounds to take a few pictures of the windmill at Sneinton, but that's not now allowed. Pay or stay out, is the rule. Wrong, in my opinion. The impressive gate of Nottingham castle. 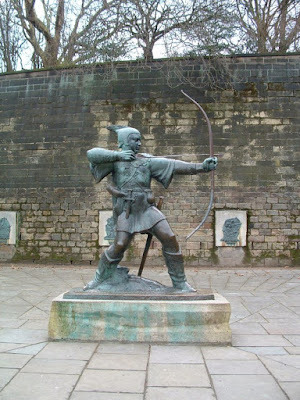 The Man himself - Robin Hood (well - his statue, anyway). You'll notice he is arrowless - they keep getting stolen! He stands in the courtyard below the castle. The Robin Hood way starts from the yard in front of the castle gates. A lovely old lace market building, dismantled and rebuilt next to the castle. The oldest pub in England since 1289 AD, don't believe the pretenders! It's an amazing place, with nooks and crannies hewn out of the sandstone of castle rock. The museum is just further on. Nottingham has always attracted players, entertainers, minstrels etc over the years. It still does, and this guy gave a great show of fire eating and juggling. I hope you have enjoyed the short tour. 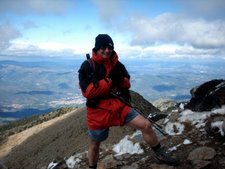 As I said, there is another entry when I was there just before Xmas, if you look back in the archive of this blog. Brought back many memories, Les. The last time I was there RH actually had an arrow ready to shoot - I must have been lucky ! Helen, I couldn't find any big rocks, only one - and there was a castle on it LOL! Hazel, yes, it's a shame his arrow keeps getting nicked! Ironic, really. The owner isn't Australian is s/he ? but in time, they both will fall. this time I hope it outlasts me! I live in Nottingham, and I think this displays Nottingham well...I hope you enjoyed it. However, I would say that the Market Square is now nicer than it was - and there are loads of events on. Hi Isaac, I used to live on the outskirts, and work in the centre of the city for many years, and I STILL love to visit it. The new square has now won me over, and I DO love it as much as the old, but you know what it's like with change, eh?